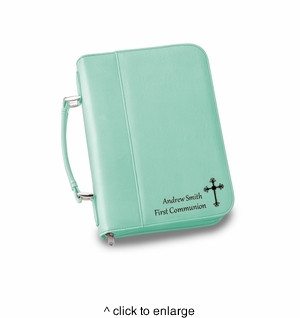 DETAILS: Well crafted with a beautiful design and personalization, this Small Bible Case is made from a leather-like material that is soft to the touch. Zipper closure and an exterior pocket. PERSONALIZATION: Personalize with two lines up to 20 characters. Choose from Black, Dark Brown, Light Brown, Mint, Rustic or Rawhide.